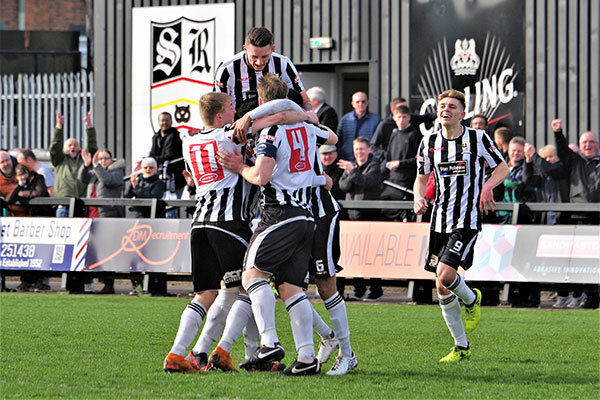 Stafford Rangers earned themselves another crucial point in their battle to climb away from the relegation and, for the second year running, put a dent in Warrington’s title chances. Joe Cuff returned to the starting line up in place of Jack Sherratt who was still suffering from an injury picked up at Witton Albion in midweek. It was an entertaining affair with both sides playing positive football from the start although it took some time before either goal came under threat. The first attempt came from the visitors after Jack Dunn spotted a run from Tony Gray on the left. He crossed for Dylan Vassallo, but his volley went into the ground and bobbled wide. Stafford responded and shortly after Joe Cuff worked an opening after cutting in from the left but skewed his shot high and wide. Warrington’s Josh Amis proved a constant threat throughout and saw his first shot of the game take a deflection off a Stafford defender on its way wide of the far post. Seconds after falling theatrically in the area in a vain attempt to win a penalty, Amis went close again with a rising shot after a smart turn, but Adam Siviter tipped over. After Matt Hill had been just off target for Stafford with a 35-yard free kick, Amis rolled another effort across the face of the Stafford goal – the angle proving too tight. Siviter kept out a Dunn free kick and a header from Wires’ skipper Mark Roberts, but it was Stafford who went in at the break with the advantage when Andrai Jones scored from close range in the 45th minute from Andy Haworth’s corner. Tony McMillan saved well from Dan Burns’ initial effort, but the Luke Jones rolled the rebound to his namesake who finished off. Stafford had several chances to add to their lead in the second half but were unable to take any of them. A slip from Roberts let in Haworth but McMillan saved well from Jake Charles. The Stafford man then hooked wide after good work from Haworth on the left. Another defensive error from the visitors – this time from Mitch Duggan – gave Joe Cuff a run on goal but again McMillan saved. And Rangers were made to pay when Warrington levelled on 61 minutes. They looked to have wasted an opportunity when Tom Thorley cut out a poor free kick but, in turn, also gave away possession. Amis found Gray on the right who crossed to the back post giving Dunn a chance he could not miss. Following the equaliser, Warrington had their best period of the game and sub Jack Mackreth missed a great chance to put them in front when he shot wide with just Siviter to beat after a good ball over the defence from Gray, then Robbie Evans produced an air shot on the edge of the area. But Stafford kept pushing forward themselves. McMillan tipped over a Theo Bailey-Jones header then gathered an overhead kick from Charles who was then halted by a well-timed tackle from Mark Roberts after linking well with Cuff. Warrington’s Russell Benjamin almost had the final say but Siviter was equal to his long-range effort.